Kitt Peak, looking south from atop the 0.9-meter Spacewatch telescope. 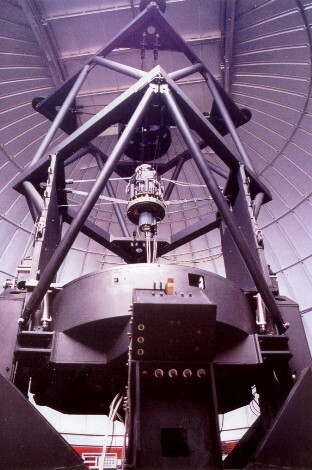 Spacewatch currently operates two telescopes on the summit of Kitt Peak. 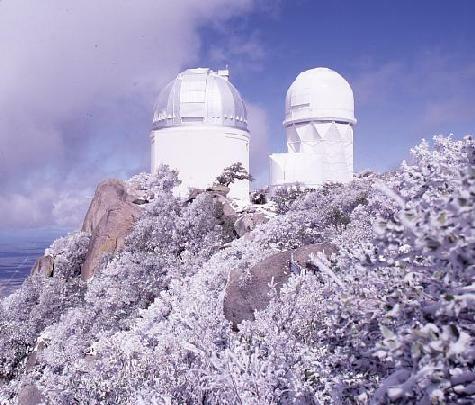 The Spacewatch 0.9-m telescope (left) on beautiful Kitt Peak during the winter. Spacewatch personnel run the Steward Observatory 0.9-meter telescope, the oldest on Kitt Peak. It was installed in 1923 on the University of Arizona campus and houses the first large telescope mirror successfully cast in the United States. The telescope was then moved to Kitt Peak in 1962. In 1969, it was used to discover the first optical pulsar. By the year 1982 the telescope had fallen into disuse, so the Director of the Steward Observatory granted the Spacewatch Project exclusive access to the telescope on the condition that Spacewatch take on all the tasks of refurbishing the telescope and performing all maintenance. Spacewatch rose to this challenge, developed an electronic imaging detector system, and made the first trial scans with a small CCD in May 1983. 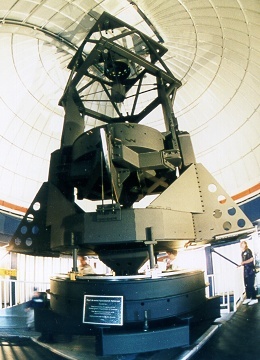 On this telescope, Spacewatch developed the technique of scanning the sky with a charge-coupled device (CCD), and has been using it to survey for asteroids and comets since 1984. 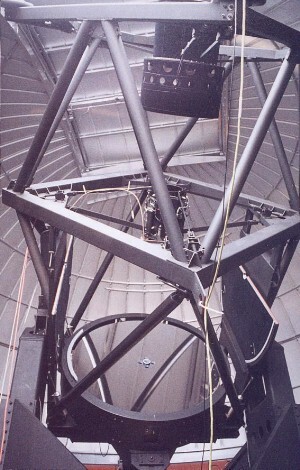 In October of 2002 the conversion to a mosaic of CCDs was completed and a new primary mirror was installed. See the Photo Gallery of the conversion. After visiting the Spacewatch facilities on Kitt Peak in 2012, Dr. Roger Carpenter, MD (ret.) provided us with images of the 36 inch telescope during construction (PPT) and in its dome on the University of Arizona campus taken by his father Prof. Edwin Carpenter, in the 1920s and 1930s. Also included are a few images taken by himself during his visit to Spacewatch showing the 36 inch in its present configuration in its dome on Kitt Peak. * All Spacewatch observations have been and will continue to be made through a Schott OG 515 filter. The filter greatly simplified lens design for the broad (0.5-1.0 micron) bandpass because it allowed us to avoid an atmospheric dispersion compensator, a difficult proposition at these fast f/numbers, and allows us to use flint elements in the lens prescription. It also reduces moonlit sky background. (Drawing by Joe Montani) Optical layout of 0.9-meter -- past system and present upgrades. (Drawing by Joe Montani) Full scale focal plane compared with projected effective size of 2k x 2k CCD used previously. Successful recovery of potentially hazardous asteroid 2002 TD66 (a=1.86 AU, e=0.54, i=4.93) taken by the 0.9 meter Spacewatch Mosaic on Oct 23, 2002 between 03:50:50 and 04:04:55 UT. Observation was taken at Right Ascension 22:50:54 and Declination +08:49:14 in of date coordinates. The asteroid was V=19.5, or more than a quarter of a million times fainter than the faintest star visible with the unaided eye. The asteroid moved 30 arcseconds in 15 minutes -- an motion equivalent to a person walking from the front bumper to the tail bumper of a car 13 miles away. The first "long" (120 second) exposure of the Spacewatch Mosaic Camera on the sky (RA 20:31:34, DEC +31:57:48), taken 2002 October 23 at 02:01:41 UT during engineering trials in bright moonlight. This "printer-friendly" version is like a photographic negative in which brighter sources are blacker and the dark sky shows white. Three CCDs are aligned east/west and the fourth one is aligned north/south to fill a round field of view as efficiently as possible. Each CCD covers 0.6 x 1.3 degrees on the sky, so the total area covered by the system is 15 times greater than that usually covered by the Earth's moon. It is also 9 times larger than that covered by the usable area of the detector we had previously on this telescope. The gaps between the CCDs are much smaller in reality than the spacing between these images. This is a "raw" (unprocessed) image that shows various effects that are easy to correct in post-processing. The variations of the background level are due to the nonuniformity of sensitivity across the CCDs. The image also shows slight differences between electronic bias levels between the two halves of the CCDs, due to the fact that the image areas are read out in two directions through two different amplifiers. Black (in reality bright) lines are due to signal bleeding away from overly saturated images of bright stars. Whitish (dark) lines are either dead columns or crosstalk from bright lines located elsewhere on the CCD. Such crosstalk is an unavoidable but removable characteristic of data collected from mosaics of CCDs. The image validates several aspects of our engineering. The uniformity of focus and quality of the star images over the whole area shows that the CCDs were mounted in the same plane and that the optical system is collimated and works as designed. Furthermore there is no "ghost pupil", or "donut" image of the optical entrance pupil, another validation of the fine optical system. The roundness of the star images also shows that the charge transfer efficiency of the CCDs is good. Discovery and Followup of Amor Asteroid 2003 EN16; First NEO Discovered with Spacewatch CCD Mosaic. In MPEC 2003-E38. The 1.8-m Spacewatch telescope in its upright position. Astrometric observations with this telescope began part time in March 2001. 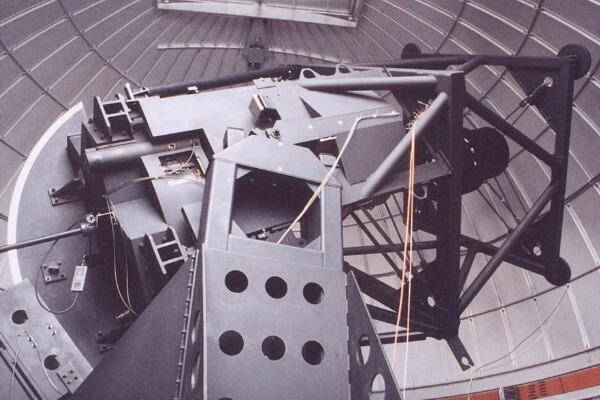 The first astrometry with this telescope reported to the MPC was made on 2001 April 13-18, and extended observing runs began in 2001 September. 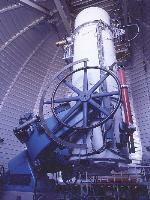 On 2001 April 21, the first astrometry with this telescope to be listed in an MPEC was made of the EA 2001 HW7. On 2001 May 24, the first astrometric recovery of a faint (V=22.6) EA was made with the 1.8-meter Spacewatch telescope; this also appeared in an MPEC. The object was 2001 HB, a Potentially Hazardous Asteroid (PHA), recovery of which was urgently requested by the Spaceguard Central Node. The first EAs discovered with the Spacewatch 1.8-m telescope were 2001 UO and 2001 UB5 on 2001 October 16 and 18, respectively. The unusually faint PHA 2001 SB170 was recovered at considerable effort with the 1.8-m telescope on 2001 Oct. 13 at V magnitude 23.3 at the urgent request of Spaceguard, resulting in the elimination of some predictions of future collisions of this object with the Earth. With the 1.8-m telescope we put high priority on objects fainter than V=20.5 magnitude because they are less likely to be observed by other stations. Potentially Hazardous Asteroids (PHAs), Virtual Impactors (VIs) as defined by the JPL NEO Office, faint objects on the Minor Planet Center's Confirmation Page, fast-moving objects (FMOs), and objects originally discovered by Spacewatch receive priority for recovery and followup with the Spacewatch 1.8-meter telescope. Routine scheduling of 20 nights per month began on 2001 Oct. 8, operation of the telescope by solo observers was achieved on 2001 October 16, and improvements to the efficiency of operation of the telescope are continuing. As of 2002 Nov. 22, about 52,456 detections of asteroids had been made with the 1.8-m telescope, where one detection usually equals three observations of position. Astrometry with the 1.8-m has yielded 1,939 object designations and 958 positional measurements of 181 NEOs, including 14 NEOs discovered with the 1.8-m telescope. The mechanical design of the tube truss by Barr is optimized by finite-element analysis to provide high resonant frequencies. The mount is an altitude-azimuth type for compatibility with the mirror support cell contributed by the Multi-Mirror Telescope Observatory. Both axes are driven by DC servo motors directly coupled to friction rollers. The CCD instrument stage is also rotated under computer control. The telescope was fabricated in the University Research Instrumentation Center (URIC). The optical configuration is f/2.7 folded prime focus with a flat secondary that locates the focal plane in the center of the optical truss near the altitude axis. This shortened the telescope enough to make the dome building affordable, and the flat secondary preserves the fast f/number of the primary mirror. The coma corrector designed by R. A. Buchroeder is a modified Klee design of 5 spherical lens elements plus a filter transmitting longward of the B bandpass. The filter greatly simplifies lens design and reduces sky background while not significantly reducing the peak-pixel brightness of asteroids. The distortion-free, flat, unvignetted field of view is 0.8 deg in diameter and the effective corrected focal length is 4955 mm. Primary mirror: 1.8 meter diameter, f/2.7 paraboloid. Folded prime focus, coma corrected and field flattened. Filter: Schott OG 515; see below. backside illuminated, and broad-band antireflection (BBAR) coated. Camera: Finger Lakes Instruments ProLine Model PL3041-LC, S/N PL0144010. Field of view: 15 arcmin x 15 arcmin. background, being a "minus-blue" (i. e., yellow-orange) color. The first picture shows the 1.8-meter diameter primary mirror. The next two pictures show the telescope from various positions in engineering mode. There are various cables and ropes hanging from the telescope that will not be present when operational. Finally, the rightmost picture shows the secondary mirror assembly (left) and instrument stage (right) suspended in the air. 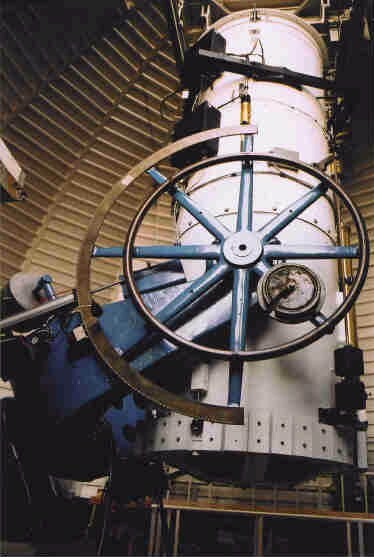 Spacewatch acquired focused starlight with the 1.8-meter telescope on a ground glass slide. The pole star (Polaris) was found and positively identified. About six other stars were acquired, moving progressively further away from the pole until the objects couldn't be found. A Panasonic low-light video camera was used to capture images of the very fast moving object (VFMO), 2000 RD53, through the 1.8-meter. Integration time is approximately 0.5 seconds per frame, thus there are very few stars in the field. The movie clips below are sped up 100x. The speed of the GIF animations will vary with the speed of your computer and internet connection. The images are blurry because the telescope does not yet have the coma corrector installed. This was an engineering run, not real science data. Note: GIF animations will display in your browser. MPG movies require an external player such as Microsoft's Windows Media Player. Rotation stage working, plus focus, tip & tilt. Videotaped focusing on a cluster, and then replaced the video camera with an SBIG ST-6 cooled digital CCD camera. We got some star fields and saved the images. With the cooled digital ST-6 CCD camera at prime focus, we determined the zero point of the instrument rotator parallactic angle and acquired every object we pointed at without searching. We observed some Landolt photometric standards as well. We made a two hour series of photometric measurements of the VFMO 2000 RD53. 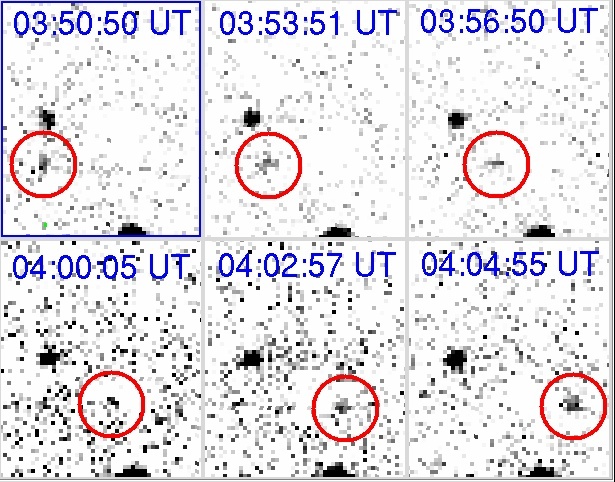 The sequence of images below shows the asteroid's movement among the background stars. 2000 RD53 appears in the left portion of each frame, moving towards the right. Its motion is fast enough to cause the image to streak during the 30 second exposures. The three images were taken about 2 minutes apart. Last night we made the most interesting observations with the 1.8-m telescope yet. The drive software is now capable of tracking on a fast moving asteroid (2000 SM10), and we got more than 3 hours of measurements of its apparent magnitude. 2001 January 24 - Successful test of the whole optical system of the 1.8-m telescope, including the 6-element coma corrector lens system. Previous observations with this telescope were made at prime focus, without the lenses that are needed to correct for the coma that is a property of any parabolic primary mirror. The coma corrector is designed to give good images over the full 0.8 degree wide field of view. To evaluate the images over this wide field using the small SBIG ST-6 CCD, we positioned the detector at 5 positions: on axis, and 4 positions corresponding to the corners of our bigger science detector that we plan to install soon. Each image is 4.4' x 5.8' across with an exposure time of 10 seconds through a Schott OG-515 filter. The seeing was reported independently by Jeff Larsen on the 0.9-m telescope to be 1".6 - 1".8 arcsec that night. The images we took of the open cluster Chi Persei are seeing-limited both on and off axis, showing that the optical design as well as the lens fabrication and the collimation of the whole system have been successful. The small CCD has been replaced by an engineering grade 2K x 2K SITe CCD with an experimental mode readout system. This system was tested on star fields and the collimation and focus were found to be good. 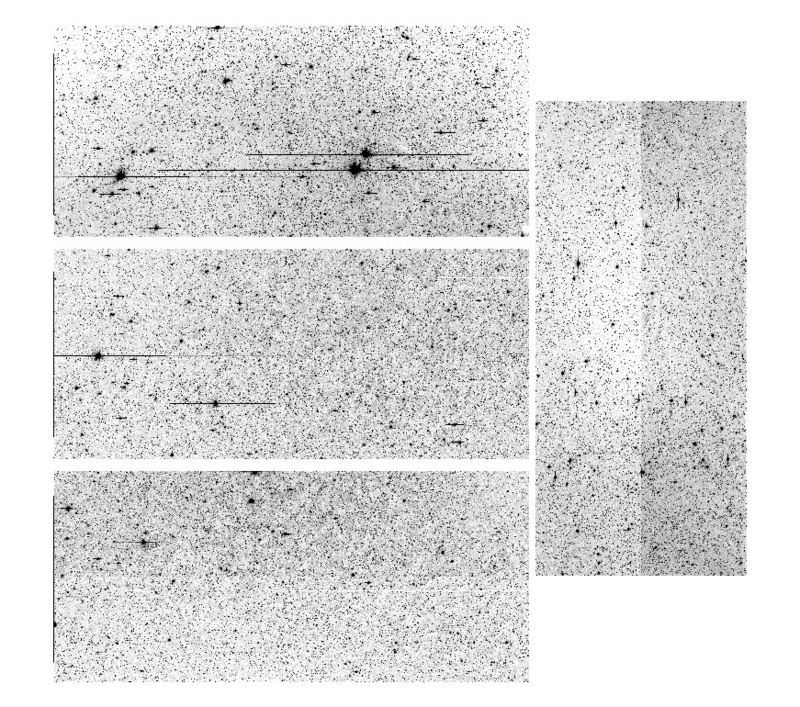 First asteroid astrometry with 1.8-meter telescope submitted to and accepted by the IAU's Minor Planet Center. The telescope has been assigned IAU Observatory Code 291. Engineering continues on the CCD readout system, software, and the telescope drives. The Earth-approaching (Amor) asteroid 2001 HW7, discovered by Jim Scotti on 2001 April 18 with the Spacewatch 0.9-meter telescope, was followed up on the 1.8-meter Spacewatch telescope on 2001 April 21. MPEC 2001-K33 This object was very faint, out of reach of the 0.9-m Spacewatch telescope as well as many others. First night of operation by a solo observer (Dr. Jeffrey A. Larsen), and the most productive night to date with this telescope, yielding 5 full survey scans, four recoveries of Earth-approaching asteroids, and a discovery of a fast moving Earth-approacher. 2011 Oct 10: We replaced the 1992-vintage imaging CCD detector on our 1.8-meter telescope with a thinned, back-illuminated, antireflection-coated CCD of 2048x2048 pixels cooled thermoelectrically with circulating antifreeze fluid as a heat sink. The smaller pixels of 0.6 arcsec as projected on the sky, and the superior flatness of the new CCD immediately yielded astrometry a factor of two more precise than before. Faster readout also allows more observations per night by use of “staring” exposures at the sidereal rate rather than the drift scanning that the slowly reading CCDs of the early 1990s required. The thermoelectric cooling system brings the detector down to operating temperature in tens of minutes, compared to the 8 4hours it took to cool down the old detector. This allows us to become operational more quickly after electrical storms clear.